This orbiting telescope is a cooperative program of the European Space Agency (ESA) and the National Aeronautics and Space Administration (NASA) to operate a long-lived space-based observatory for the benefit of the international astronomical community. HST is an observatory first dreamt of in the 1940s, designed and built in the 1970s and 80s, and operational only in the 1990s. Since its preliminary inception, HST was designed to be a different type of mission for NASA -- a permanent space-based observatory. To accomplish this goal and protect the spacecraft against instrument and equipment failures, NASA had always planned on regular servicing missions. Hubble has special grapple fixtures, 76 handholds, and stabilized in all three axes. HST is a 2.4-meter reflecting telescope which was deployed in low-Earth orbit (600 kilometers) by the crew of the space shuttle Discovery (STS-31) on 25 April 1990. 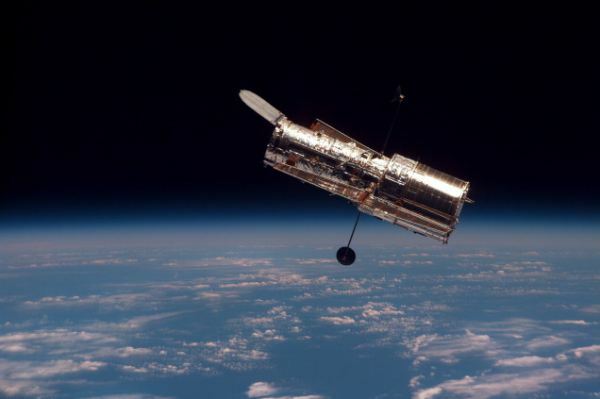 Responsibility for conducting and coordinating the science operations of the Hubble Space Telescope rests with the Space Telescope Science Institute (STScI) on the Johns Hopkins University Homewood Campus in Baltimore, Maryland. STScI is operated for NASA by the Association of University for Research in Astronomy, Incorporated (AURA). HST's current complement of science instruments include two cameras, two spectrographs, and fine guidance sensors (primarily used for astrometric observations). Because of HST's location above the Earth's atmosphere, these science instruments can produce high resolution images of astronomical objects. Ground-based telescopes can seldom provide resolution better than 1.0 arc-seconds, except momentarily under the very best observing conditions. HST's resolution is about 10 times better, or 0.1 arc-seconds. Although HST operates around the clock, not all of its time is spent observing. 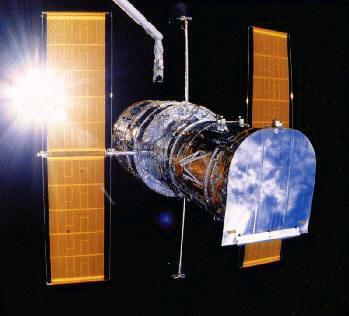 Each orbit lasts about 95 minutes, with time allocated for housekeeping functions and for observations. "Housekeeping" functions includes turning the telescope to acquire a new target, or avoid the Sun or Moon, switching communications antennas and data transmission modes, receiving command loads and downlinking data, calibrating and similar activities. Engineering and scientific data from HST, as well as uplinked operational commands, are transmitted through the Tracking Data Relay Satellite (TDRS) system and its companion ground station at White Sands, New Mexico. Up to 24 hours of commands can be stored in the onboard computers. Data can be broadcast from HST to the ground stations immediately or stored on tape and downlinked later. The observer on the ground can examine the "raw" images and other data within a few minutes for a quick-look analysis. Within 24 hours, GSFC formats the data for delivery to the STScI. STScI is responsible for data processing (calibration, editing, distribution, and maintenance of the data for the scientific community). 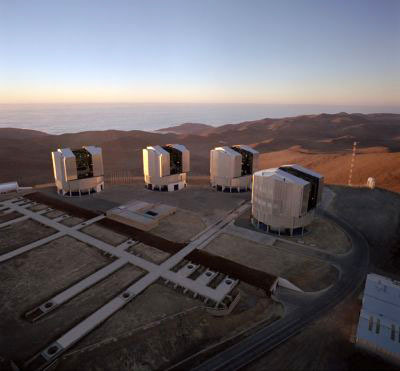 The Very Large Telescope (VLT) at ESO's Cerro Paranal observing site. 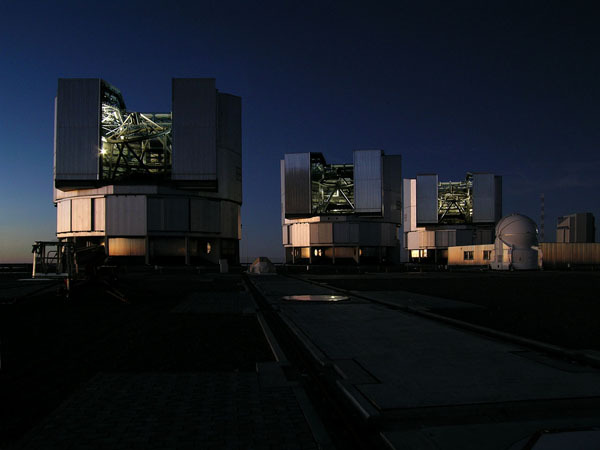 The VLT is the world’s most advanced optical instrument, consisting of four Unit Telescopes with main mirrors 8.2-m in diameter and four movable 1.8-m diameter Auxiliary Telescopes. The telescopes can work together, in groups of two or three, to form a giant interferometer, allowing astronomers to see details up to 25 times finer than with the individual telescopes. Located in the Atacama Desert of Chile, Paranal is over 2600 metres above sea level, providing incredibly dry, dark viewing conditions.